Wow what a few weeks we've been having with little Budlington! Those that follow on Facebook will be aware that her recent jaunts with her walking aid have reached a whole new level after we walked all the way to the local pub for a Sunday meal! Rosie and I set off 20 or so minutes earlier to do the five minute walk and she managed the whole way without having to be carried once. Stopping every now and then to take in the sights and the excitement of the main road. I had worried it may have been a bit overwhelming for her especially with the traffic noise but she took to the challenge with erm.... both feet! 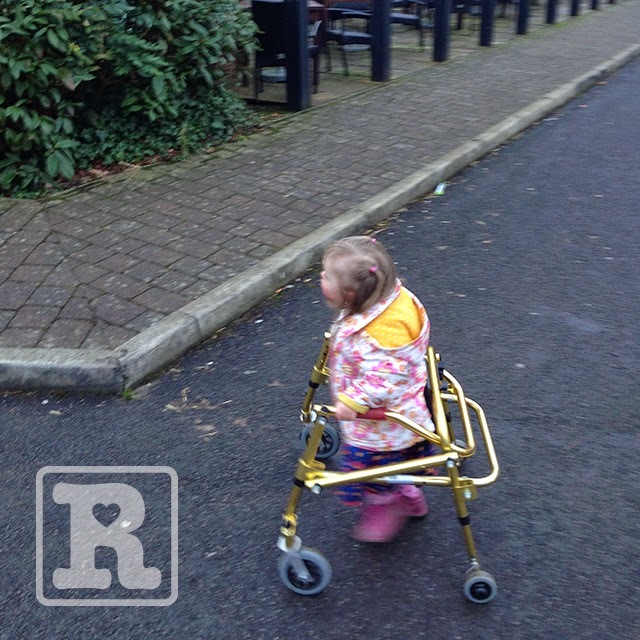 We were a few minutes late for our table time but nothing could stop the feeling of pride I felt in seeing her laughing and smiling and being able to walk herself into the restaurant without having to hold our hands or be pushed in her pushchair – okay so she still had the walker to give her the support and stability but make no mistake, Rosie was doing this with her own efforts and enjoying every moment including the attention and encouragement of passing strangers along the way. This was a couple of weeks ago now and since then we've been determined to keep her at it with encouragement not expectation. One thing we have learned about Rosie is Rosie does things her way and in her own time so any encouragement that appears too pushy and expectant has the complete adverse effect. Her speech and understanding have been coming along wonders again thanks to the efforts of Mummy and the time she is spending at mainstream Nursery amongst her peers, but ultimately with her one-to-one Lorraine. 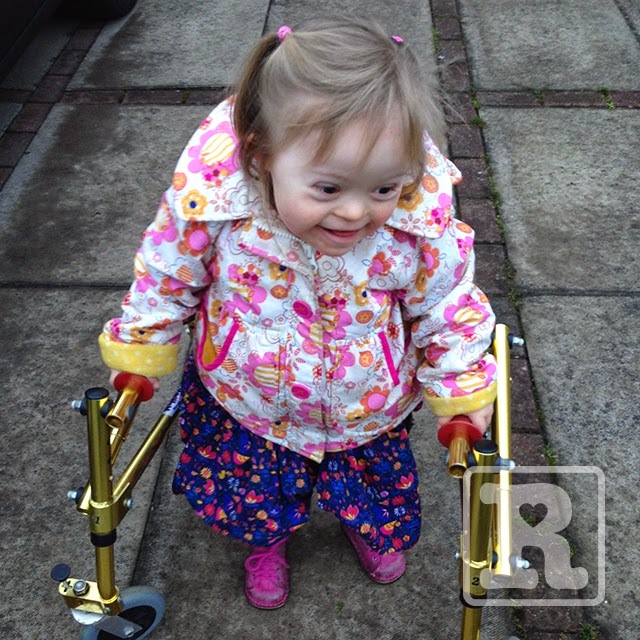 I hear so often people say how blessed we are with Rosie and yes I do feel that but I think our true blessing has come with Lorraine who is just the most perfect one-to-one for Rosie and who Rosie seems to bounce off perfectly – learning through fun and their wonderful connection. 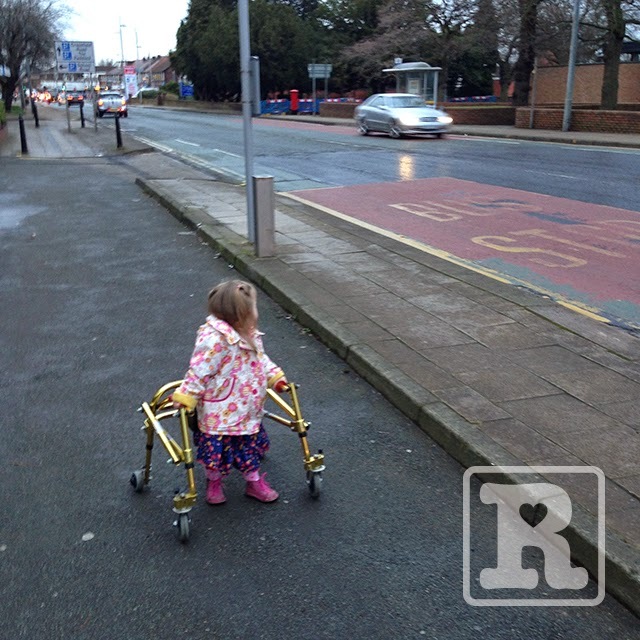 The progress Rosie has made since attending Nursery has been nothing short of amazing. 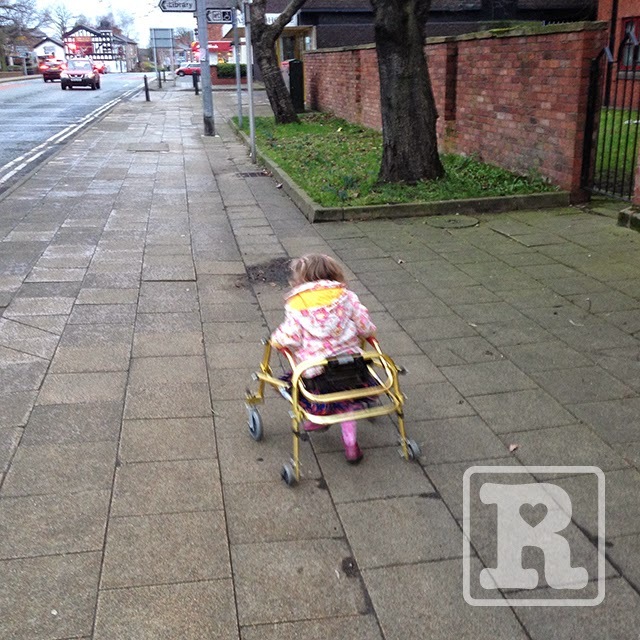 I refer back to the walking frame and how we struggled for months to get her anywhere near it let alone using it, when suddenly seemingly from nowhere she's up using it and racing around the playground. Today we had the news we've been awaiting for since, well, forever! 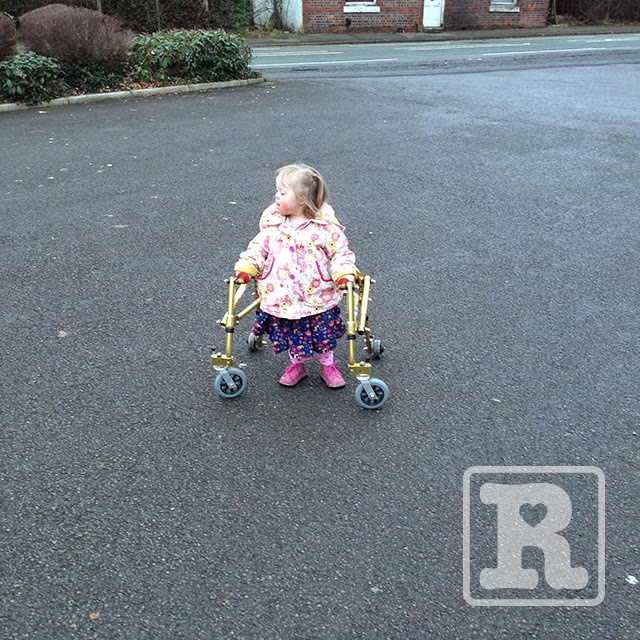 "Apparently Rosie has walked a few steps on her own at nursery with the Physio. I'm crying." Well I tried, honestly I did...but I couldn't get a grip and the tears went and I had to just blurt out what I had just read! I was so overwhelmed by the news as it's another of my 'What if's' that is coming ever closer to being struck off! Needless to say by the time I got home to witness the few steps first-hand she'd had enough and just wanted a cuddle. I hope to be able to post a video soon of this but I'll wait until I witness it for myself! She is a little star, and so is Lorraine. They do indeed have a special relationship and she was so proud sharing Rosie's achievements over the fence! Go Rosie! Oh lord, rest now while you still can! She's off, and if our Theo is anything to go by, you'll be spending your days chasing her down. :) Congratulations, Rosie! What an achievement as they all have been and will continue to be. Well done Rosie. 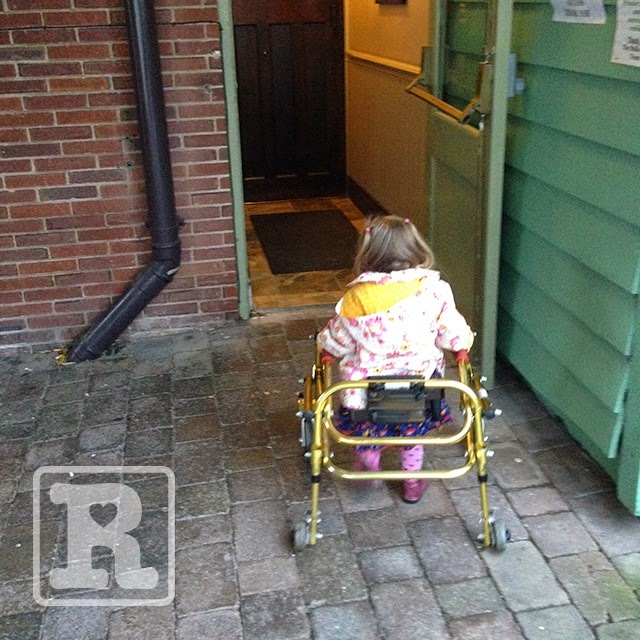 Rosie and her family are truly beacons of hope for all children and families out there with extra challenges. 2 steps today tomorrow the world. I'm sobbing. Oh, Rosie. Big things. fantastic Rosie, you guys sound so proud, it's beautiful to watch you stand by Rosie in all that she does in her time: I can't help but giggle at some future time when you are going to tell Rosie that the first walk she took was to the local pub! That's fantastic - well done Rosie! We've noticed a big difference with our daughter (just turned 2) since she moved up a room at nursery ... big step forward in speech and communication. Fantastic! 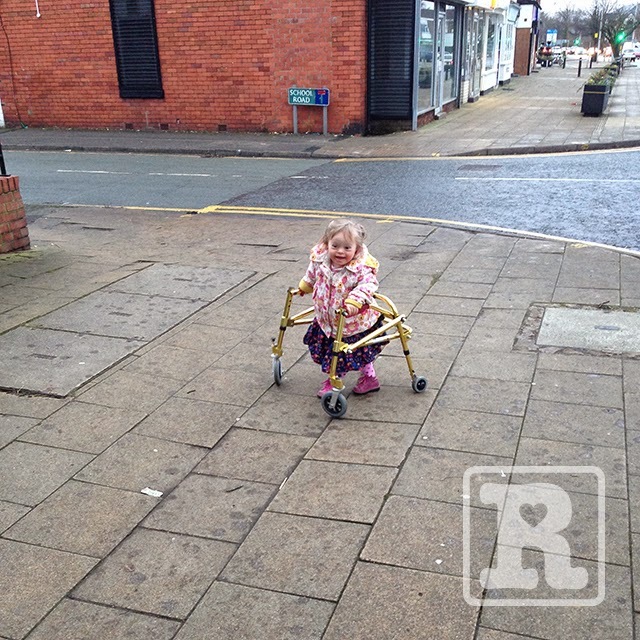 What wonderful pictures, we are so delighted to see Rosie whizzing off up the road. No stopping her now! Well done Rosie! Hayley has partnered with Fink Cards to help create a set of cards that help new parents talk about Down's Syndrome. Talking About Down's Syndrome - Conversations for New Parents will be published by Fink Cards in March 2015. Fink (Family Interaction Nurtures Kids) was founded in September 2008 by mother of 4, Lisa Warner. After Lisa created a simple conversation card game to stop her children arguing at mealtimes, the business was launched to help other families to start fun and engaging conversations in times of need.